Bill was sadly called to the great re-org in the sky in the early hours of Saturday 28 Jan '17. Bill Rudd joined 9 Parachute Squadron very early on in his career and served with the Sqn until he was a SNCO. He completed tours of Radfan & Saudi Arabia with The Sqn. Bill also did 5 years working for the Sultan of Oman after he finished in the British army. I remember being SSM 9 Sqn and visiting the Blackpool AEA reunion. I'd managed to convince the OC (Rob Rider) it was a good idea to fly across from N. Ireland where we were on tour. We should take some of the younger lads with us too who could mingle with the older ex Sqn blokes. We were to host the EinC (A) who was Albert Whitley a 59 man himself but an extremely affable character who many reading this will know. I remember being met by Dot Rudd at the reception of The Norbreck Castle Hotel as Bill was off hosting and organising, fine tuning etc. We went to the bar ready to host the EinC (A), got a drink and made sure we had a pint of bitter ready for the VIP's arrival. The rest of the day into evening passed with great company, a superb meal and of course Bdr Albert's fine after dinner speech. Everything was going too well if that was possible until next morning when I came downstairs for breakfast. There were our young impressionable paratroopers being taken on by Bill Rudd in his underpants, hearing aids in and all, to a swimming race. He'd been at the bar all night drinking with them telling tales of daring and sporting prowess no doubt. One can only imagine how he coped with wrapping up the weekend let alone seeing off his VIP visitor with no sleep. I heard he won the race too! The AEA was of course his passion, of which he was a lifetime Vice President - Bill formed the Yorkshire Branch with Dave Edmonds, Charlie Dunk and a few others in the TA centre Harrogate where Dave was the PSAO. Bill was then Chairman of the branch for over 25 years. Only handing over the mantle to me last year now with some 70+ members! We never expected him to ever hand it over and truth be known, he never did completely. He roped me in as President after Tom Thornton sadly passed away. With Bills hearing being so bad despite whatever version of hearing aids he was on at any time (civvy or issued as he called them, privately purchased or NHS) the meetings took forever with members trying to make their point. Mike Pallott suggested to me that we simply do a swap - Chairman & President. That seemed like a I had no real say in anyway. This worked pretty well as he was still in charge really. It just meant he had me to relay everything to him close up rather than shouting across the room. Meetings were more efficient, not quicker as everyone wants a say now that they can be heard. Bill & Adam sample a few pints together! Bill always said to me "I used to be quite the man about town you know Adam when I was younger"! My response was always something akin to "No change there then Bill" because I believe he knew and charmed just about everyone in Ripon, but definitely anybody who lived from the Spa Gardens to Claro Barracks as they would have to pass his gate on the way into town. Bill loved his garden and took great pride in entering the Ripon in bloom competitions annually, taking a prize every year, so he'd sit in his garden or be tending it, and it was so easy to engage just about anybody who walked past. Generally with a glass of wine for the ladies and a beer for the men — generous old soul that he was. Of course there was one other woman who he shared his life with — Vera Lynn! And he played her from dawn till bedtime sometimes! You could chat to him on the phone, well listen to him shouting to you at least, and hear Vera Lynn in the background consistently. Well he'll have to wait a little bit longer to see her though, she's still thriving with a new album released at 100 years of age this year. During our many conversations, Bill and I realised we had both served in the same places at the same time unknown to each other then, clearly in different ranks. Bill was in fact a Captain in the Falkland Islands in 1984 and I was a young LCpI when 9 Sqn took over as the Falkland Island Fd Sqn. Bills opposite number in 9 Sqn was Paddy Fulton, they knew each other well, in fact were on the same RSMs course together. How on earth they survived each other is a miracle as they could both drink like Gilkes pumps. Fulton used to call himself the hardest head in the Sqn and with Bill Rudd's pedigree, you can only begin to imagine what those two egos together were like! According to Bills version of the story, the pair of them met up to do a handover/takeover of QM's which became a good old social within only a few hours. So the rumour goes is that Paddy couldn't be found for at least 24hrs afterwards. But Rudd sustained and was at work as usual the next day telling the tale and denying any knowledge of Fulton's whereabouts, giving his old pal time to sleep his hangover off. In a tale told to me by Bob Prosser, there used to be this particularly good boxer at 9 Sqn who was a heavyweight called Tom Tuddenham. Nobody would fight him so Bill said, "I'll do it". Of course Bill got beaten so next time it came to the boxing, same scenario, nobody wanted to take Tuddenham on and Bill again said, I'll do it, he's going down this time though. Sadly not, beaten again but that is testimony to the man about town, Bill Rudd's spirit. He was a fighter who you couldn't help but love and admire. He fought through the adversity of his beloved Dots illness and showed such a brave and smiling face. I can honestly say that I have never heard him shirk or complain about much in the time I knew him. Sure he'd voice his opinion and yes he there were things he disliked, but Bill Rudd was never a moaner or felt done down, on the contrary, he was a much larger than life person who got on with the job and made the very best of everything. He was always busy organising some battlefield tour to Arnhem or Normandy or the AEA annual reunion. He ran the Arnhem tour every year with the help of his great friends Ed Van Der Laan & Tom Oomens both honorary members of the Bill Rudd Appreciation Society- sorry, Yorkshire branch of the AEA I should say. Both of whom arrange the smooth running of the trip with transport and accommodation arrangements that side, cutting through any red tape. As many reading this will know, we are met by a bus provided by the Dutch military Police and get priority at the road blocks in Oosterbeek. We are hosted royally and all attributed to Bill's friendship with these two fabulous friends of our association. I'm happy as I am! Always a happy soul no matter what ailments or complaints he had. All joking aside, along with the wonderful memories of my dearest friend, with whom we all shared many fantastic times on plenty of different occasions. I have to say "Goodbye Bill" from all of us. You fought right up until the end and still wouldn't be beaten. You've defied them all and you're walking again already! A true legend amongst men, the likes of which are rarer than the Highlander, who's famous phrase was "It's better to burn out than to fade away". Bill Rudd definitely managed that. We'll all be seeing you soon mate at the big DZ Rally upstairs! From Sappers to Brigadiers, both serving and retired, they came from all corners of the UK to bid a final farewell to Bill Rudd. The service held in Ripon cathedral gathered in a congregation in excess of 500. 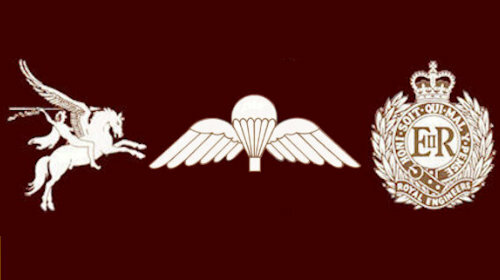 Representatives of serving and retired Airborne Engineers, mingled with the green berets of 59 Cdo Engineers as they mingled with former colleagues from 26 Armoured Engineers and those of 28 Amph Engineers and 38 Engr Regt (formerly located in Claro barracks in Ripon, where Bill served as the RSM). There were also numerous civilian friends and colleagues, in particular his close friends from Holland, Ed Van De Lann and Tom Oomens. Those who had left it till the last minute to seek overnight accommodation in the city hotels, were sadly disappointed. The bed spaces in each and every one had long been booked and late comers had to resort to any available B&B. On the conclusion of the burial service, everyone was invited back to the Spa hotel. The huge hall and adjoining rooms were jammed packed with former colleagues renewing acquaintances with those they'd not seen in years. 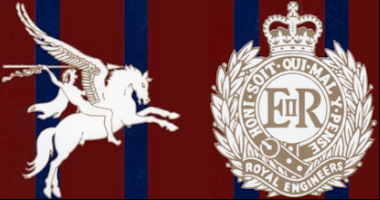 It was a fantastic occasion in celebrating the life of one of the Corps of Royal Engineers most iconic characters. Congratulations are extended to Adam Frame MBE, who had organised much of the day's ceremonial proceedings. Bill was given, what can only be described as a "Fantastic Send Off'. We shall miss him. RIP Bill Rudd MBE.